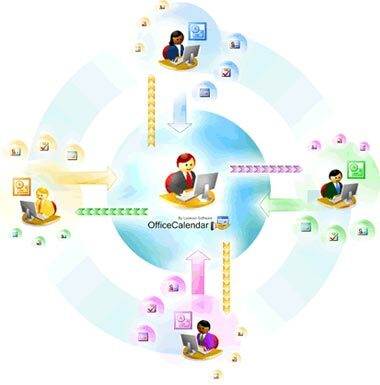 OfficeCalendar is a computer software program that is an alternative to Microsoft Exchange Server. OfficeCalendar is Outlook plugin that enables the sharing Microsoft Outlook calendar, contact, and task information with other Microsoft Outlook users on a computer network. Outlook calendar sharing and group scheduling are both easy and affordable with OfficeCalendar because it does not require Microsoft's Exchange Server, which is considered too expensive and too complicated for small businesses. Web access to your Outlook calendars, contacts and tasks is convenient from anywhere or anytime with OfficeCalendar Online. This valuable feature is available to users subscribed to the OfficeCalendar Premium Maintenance and Upgrade Protection Plan, and allows you to see your personal and shared Outlook calendars just as your would from your own copy of Microsoft Outlook. OfficeCalendar sharing security applies to OfficeCalendar Online as well, ensuring that you can only see online what you can see in Microsoft Outlook.